The following year over year graphs compare the previous 365 days with the same period one year ago (i.e. 4/30/2013 through 4/30/2014 versus the same period from 2014 to 2015). With such a small market (sample size) these numbers can jump around, so it’s worth comparing these graphs over a period of time. My Crested Butte and Gunnison market report archives can be found on this page. If you are looking for other statistics, such as inventory, or a more specific neighborhood analysis, please contact me. Crested Butte South: With only 20 residential properties for sale, and 7 of those under contract, CB South is one of the most active neighborhoods in our area. This low inventory is leading to increasing land sales and construction. If you’ve been waiting to sell in CB South, now is a great time to list your property. Mount Crested Butte (All Residential): Total sales are up 32% compared to 2013/14 although the average sales price is down. With a smaller inventory, asking prices continue to rise. The fall in average sales price is attributable to a small number of very high end sales in 2013, and the condo market (see below). Mount Crested Butte (Condos/Townhomes): Condo sales near Crested Butte Mountain Resort are up 32%, although the average sales price is down slightly. Taking a closer look at the numbers, the absorption rate for condos under $250,000 is around 6 months, while over $250,000 it is closer to 24 months. In other words, people are buying the less expensive condos. I have been having trouble finding condos for buyers in this price range, so if you’ve been looking to sell in this lower price range, it’s a great time. A new development slated for December 2015 called Timbers will improve inventory in the lower price range- call me for details. Crested Butte: The town of Crested Butte had 40% more sales this year than last, and the average sales price is up as well. 8 of the 33 current listings are under contract. Crested Butte Area: This category includes neighborhoods such as Skyland, Larkspur, Riverbend, and Trapper’s Crossing. While the number of sales in this area is down overall, the average sales price is up. Much of this is due to sales of condos (Stallion Park) in the Buckhorn Ranch area in 2013. Gunnison: The Gunnison market appears to be heating up. Seemingly every day in April, a new home went under contract. 25 of the 87 current listings are under contract. Gunnison Area: This includes areas such as Dos Rios, Ohio Meadows, Cranor Hill, and Hartman Rocks. Sales price is trending upward, and total sales were up 30%. Like downtown Gunnison, many properties are under contract. Total Residential Sales: This category covers our entire MLS area, including Lake City, Pitkin, Crested Butte, Gunnison, and points between. 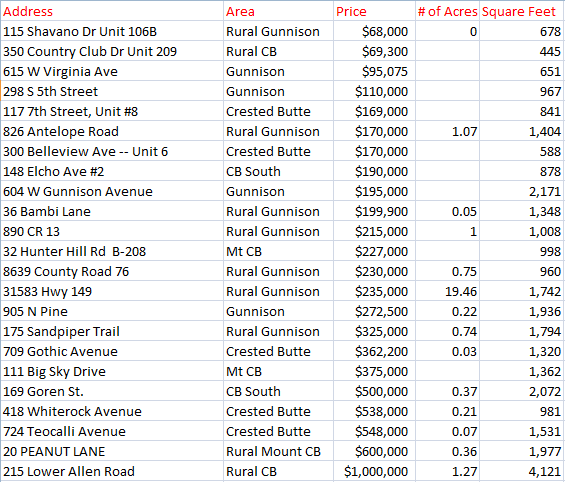 Land Sales (Greater Crested Butte area): The change in land sales in the Crested Butte area has been noticeable. A quick glance at the chart below tells the story, with buyers particularly interested in the CB South area. Land Sales (Total): This category also covers our entire MLS area, including Lake City, Pitkin, Crested Butte, Gunnison, and points between. 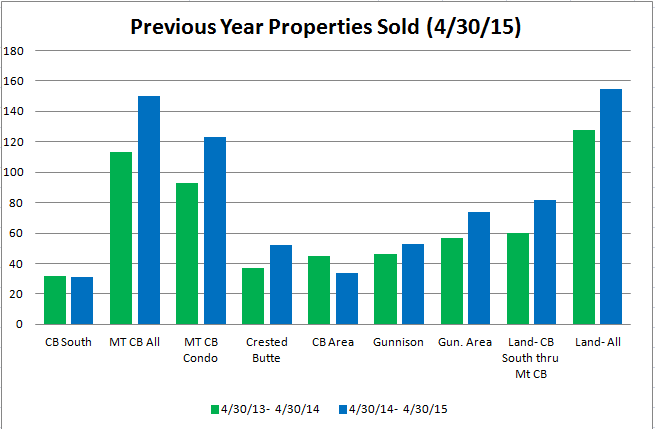 Source: Gunnison Country Association of Realtors’ MLS. Reported sales not necessarily sold or listed by Frank Konsella and are intended only to show area trends. 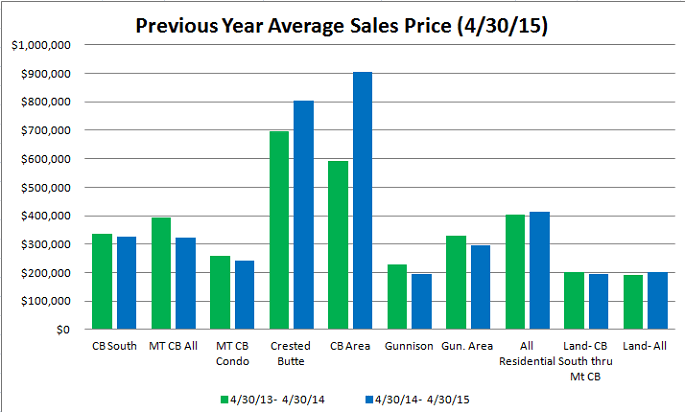 April 2015 Crested Butte Real Estate Market Report: Graphs, statistics, sold data, and analysis of the Crested Butte and Gunnison markets, by neighborhood.